Clicking the Review link next to Privacy & Settings (after hovering your mouse over your photo button) takes you to the settings page, which contains information about your account and your LinkedIn settings. Click the Communications header on the left side of the screen to bring up the Communications settings. This is your hub for controlling how you interact with LinkedIn and how the site communicates with you. 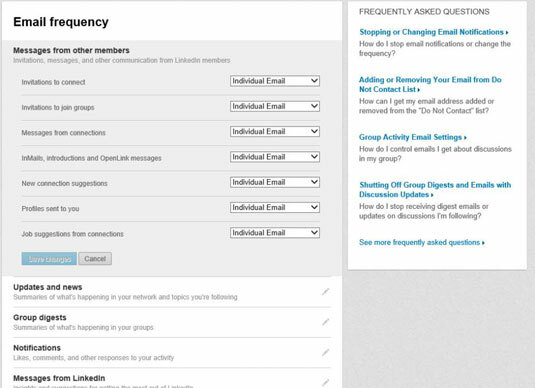 On the Account & Settings page, click the Set the Frequency of Emails link in the Emails and Notifications section. You’re taken to the Email Frequency page. For each section, like Messages from Other Members, click the pencil icon on the right side to expand the list of options. 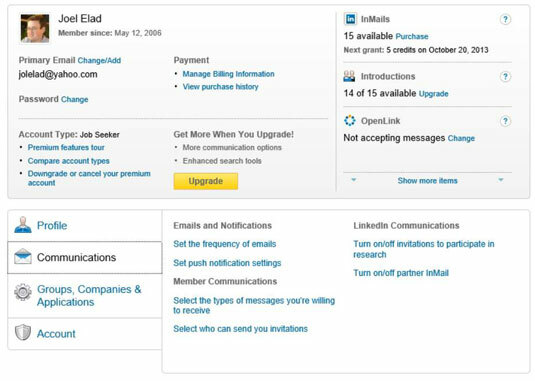 Individual Email: As soon as something occurs in a given category, like introductions, invitations, or job notifications, LinkedIn sends you an e-mail with that one item in the e-mail. Weekly Digest Email or Daily Digest Email: Instead of individual e-mails, LinkedIn groups activities in a given category and sends you one e-mail in a digest format, with a summary at the top of the e-mail and the detailed activities below the summary. Note that Daily Digests are for Group updates, while Weekly Digests are available for General and Group updates. No Email: Turn off e-mail notification. You can read the message, though, when logged in to the LinkedIn site. (Optional) Click the pencil icon next to the Messages from LinkedIn header, and select Individual Email for the Announcements, Tips, and Insights into New Products and Features option to receive information from LinkedIn. Scroll down to the bottom of the page and click the Save Changes button. You return to the Account & Settings page.